The presence of IT companies and upcoming connectivity upgrades such as the metro project have been benefitting Kolkata’s rental market for long now. The analysis of the city’s rental landscape in Apr-Jun 2016 vis-à-vis Apr-Jun 2015 indicates that South Kolkata and North Kolkata continued remaining the favourites for rental accommodations in the city of joy. Let’s delve deeper into the residential rental market of Kolkata. At a time when the average capital growth in Kolkata has been plateauing for a very long, primarily owing to weak absorption rates and receding sales volume, the demand for rental properties is on a rise due to the ever growing influx of working migrants. According to the latest 99acres.com Insite Report (Apr-Jun 2016), the rental market in the city outperformed the capital market with an average two per cent year-on-year (YoY) growth in rental values. 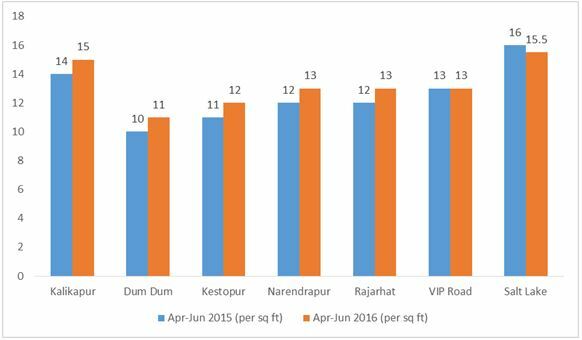 Kalikapur: Located in North Kolkata, Kalikapur recorded the highest rise in rental values to the tune of 12 per cent during Apr-Jun 2015 as compared to same quarter last year. “The growth can be attributed to the easy availability of land parcels, which allowed developers to build and offer residential projects at lower prices. This allowed buyers to put their properties on rent at a relatively lower rate than the locality’s expensive counterparts located on the EM Bypass,” adds Poddar. In addition to this, serene and peaceful environment, better road connectivity, the upcoming metro and a sustainable model for the supply of drinking water have increased the attractiveness index of the housing pocket. Dum Dum: Dum Dum in North Kolkata has become an upbeat residential destination for investors and end-users offering properties for purchase as well as for rental purposes. Despite the locality being densely populated, proximity to the international airport, seamless road connectivity to major parts of the city and upcoming Dakshineswar-Barasat metro line collectively work in favour of the region. The majority of the tenants in the region are either airport officials or IT professionals. The locality witnessed a rental appreciation of 10 per cent in the last one year as per the latest Insite report by 99acres.com. Kestopur: Another densely populated suburb in North Kolkata, Kestopur earned a nine per cent annual rental growth owing to its strategic location close to Salt Lake, Sector V and major business centres such as Park Street. Further, the locality is best served in terms of road connectivity via VIP Road, which connects the region to the airport as well as to major parts of the city. Narendrapur: Narendrapur in South Kolkata is one of quickly developing suburbs with many upcoming residential projects. Supply of budget rental inventory attract the tenant community to the pocket, which enjoys seamless connectivity because of being situated alongside EM Bypass Road. While the widening of the EM Bypass stretch fuelled the realty market in the region, in a recent development, the Kolkata Municipal Corporation (KMC) has inked a loan agreement of Rs 1,300 crore with Asian Development Bank for building water booster pumping stations and modernizing the drainage network in Kolkata, which includes EM Bypass as well. This development is anticipated to further work in the favour of the region. Further, the under-construction metro link between Garia and Kolkata airport would be an added advantage for the rental market of the locality. As per the Insite Report (Apr-Jun 2016), Narendrapur recorded an annual rise of eight per cent in rental values Y-o-Y. Rajarhat: The satellite city of Kolkata, Rajarhat, which was developed in the 90s, continues to be the top investment as well as an end-use residential destination. The factors which have attributed to the growth are the presence of IT/ITeS companies in the vicinity, better road connectivity via VIP Road and the upcoming New Garia to Airport metro line. Several renowned developers such as DLF, TATA housing have their residential projects in the region offering varied amenities to suit the lifestyle of IT professionals. As per the 99acres Insite report (Apr-Jun 2016), the locality witnessed an annual rental appreciation of eight per cent. Why rents slumped in Salt Lake and VIP Road? The two popular residential localities in North Kolkata which once witnessed a robust rental market were Salt Lake and VIP Road. However, the Insite report highlighted that the demand for homes on rent slumped in these localities with Salt Lake recording an annual rental drop of three per cent and VIP Road recording no growth. Realty stalwarts believe that both these localities have now reached their peak and have turned into premium localities. Buying and renting properties in these areas have become a costlier affair. For instance, properties which were available for rent at as low as Rs 5,000 per month two years back, are now available for around Rs 12,000-Rs 13,000 per month. This surge in rental asks is making tenants explore affordable suburbs offering similar kind of social infrastructure at lower costs. Although, mini flats are available at cheaper prices, there are no takers. Overall, Kolkata remains to be an affordable residential destination as compared to other metro cities such as Mumbai, Delhi, and Bangalore. To maintain the growth at the same pace, the state government has to do a lot of groundwork for making the city attractive to foreign companies.